Jillian Barrell as the Sylph in rehearsal. Photo by Tzu-Chia Huang. Bio: A magical creature, who has been in love with the young Scot, James, for years. She intervenes right before his wedding by taking the ring intended for his future bride Effy and heads into the forest. However, things don’t go to plan when the fortune-teller Madge enchants a scarf with an evil spell that ultimately becomes the downfall of her and James. Bio: A young Scottish farmer, whose doubts about his impending marriage lead him to throw caution to the wind and follow a mysterious Sylph into the forest. Life seems to get a bit more exciting but his poor treatment of the fortune-teller Madge catches up with him and in the end, he is left heart-broken. Bio: A young, soon-to-be bride, Effy’s future is cast in doubt when her fiancé gets cold feet and runs away with a mystical creature. With James no where to be found, Effy is left heart-broken until James’ friend Gurn proposes and they get married! Bio: One of James’ best friends who secretly longs for Effy, Gurn tries his best to do the right thing and go after James in the forest. He is then misled by the fortune-teller Madge but all ends well when he consoles Effy and ends up marrying her. Bio: A fortune-teller who is humiliated by James when she makes a prediction he does not like. Madge gets her ultimate revenge by conjuring an evil spell which leads to death and despair. 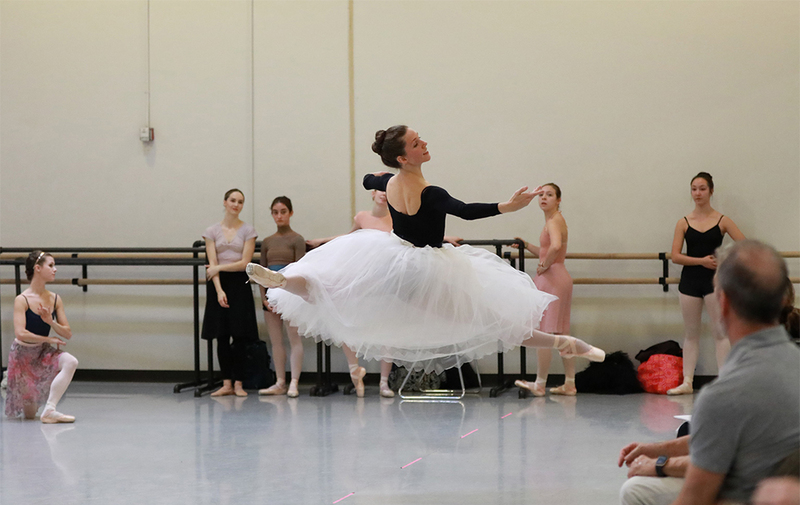 Ib Andersen and Mimi Tompkins in rehearsal for “The Firebird.” Photo by Tz-Chia Huang. Bio: A.K.A. the Alien in Ib Andersen’s version! A mysterious creature with powers that include controlling people’s minds, the Firebird is able to destroy the evil Kastchei and bring the Prince and the Princess together. Bio: An adventurous spirit, the Prince discovers a mysterious Firebird, who leads him to another world. The Prince finds true love in the world of the Immortal Kastchei and fights the evil creature and his monsters to free the captured princess. Bio: With most of her life spent as a captive of the evil Katchei, the princess’ only respite is her recreation time with her tribe of warrior princesses. One day, destiny comes knocking and she and her tribe are saved by the Prince and the Firebird. Bio: An evil, immortal creature, who rules over a land filled with monsters, people he has captured and enslaved who have lost their humanity under his spell. The Firebird and the Prince serve him poetic justice as he meets his end and all live happily ever after. We are officially one week away from opening night! Click here to get your tickets.